Graduates of the Urbana Police Division’s Safety Town receive items during the program’s graduation ceremony June 12. Officers from left are Lt. Seth King, Chief Matt Lingrell and Officer Todd Pratt. 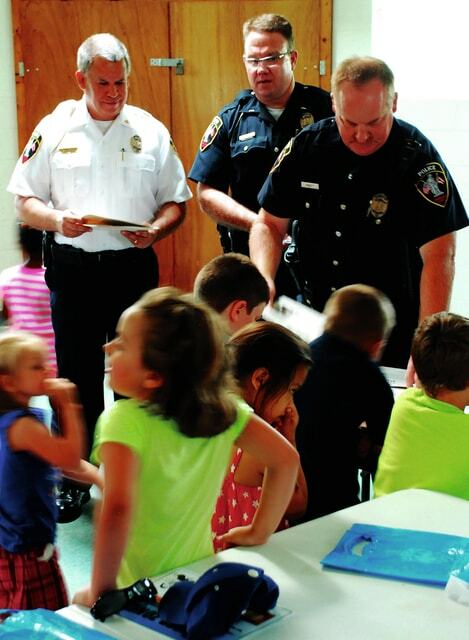 Graduates of the Urbana Police Division’s Safety Town receive items during the program’s graduation ceremony June 12. Officers from left are Chief Matt Lingrell, Lt. Seth King and Officer Todd Pratt. Thirty-one children graduated from the Urbana Police Division’s Safety Town on June 12 during the first week of this year’s program. Located in Melvin Miller Park, the program is aimed at children headed for kindergarten and has educated children about safety issues such as Stranger Danger, pool safety, fire safety, bus safety and calling 911 since 2012. Urbana Police Officer Todd Pratt said a little over 200 children have gone through the program since it started, including the children who completed the program June 12. Pratt added the first week’s attendance tripled last year’s attendance and police anticipate having 31 more children attend the program this week. Urbana Police Officer Jason Kizer said as the program has progressed over the last three years, police have a better idea of the subjects and topics children need to know and what will help them when they are put in a safety situation. “It’s all about prevention and trying to limit any type of child injury or child-related crime in the future,” Kizer said. Multiple local agencies help police provide hands-on experience for the children, including the Urbana Fire Division and CareFlight. On hand for the graduation ceremony were Chief Matt Lingrell, Lt. Seth King and UPD mascot Officer Stanley. The graduates received multiple items during the ceremony including a certificate and police badge.